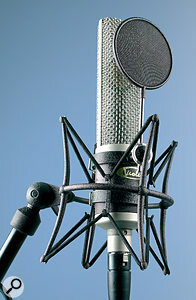 Does the sound of this distinctive-looking mic live up to its striking exterior? Latvian mic manufacturers Violet Design take a very sophisticated approach to microphone design, both technically and visually. Their new Wedge model is certainly distinctive in appearance, but it is actually a re‑engineered version of the company's original 'Dolly' model. The single‑sided, 21mm capsule uses a six‑micron Mylar film that's sputtered with gold alloy (the other component of the alloy remains a mystery), and is supported inside a long, dual‑layer, wedge‑shaped basket, to reduce the acoustical impact of the enclosure on the sound. There's very little frame around the edge of the basket, and the capsule itself is supported by a long rod to keep it well away from any obstructions. The first stage of the discrete, class‑A, transformerless circuitry is located close to the capsule, to minimise noise. Standard 48V phantom power is required for operation. Despite its modern basket shape, the Wedge, which measures 210 x 42mm and weighs 350g, has a distinctively vintage vibe, with satin‑metal plating to the basket and body frame, augmented by a nicely understated, metallic dark‑purple paint job on the body sleeve. It comes in a padded wooden box, with a rigid stand‑clip and screw‑on sleeve for the output connector (the latter a cosmetic touch, for when the fancier shockmounts are used). Speaking of which, there's a choice of three types of shockmount, as well as a pop filter, but these are all optional extras. The included stand-mount has an integral locking ring that screws to the thread around the XLR output, which makes it very safe and secure, even when the mic is inverted. A cursory examination of the frequency‑response curve of the Wedge shows it to be nominally flat over the 20Hz to 20kHz range, but with a very shallow presence bump, centred at around 5kHz. According to the designers, the mic was created to offer a warm tonality combined with a high output level and low noise, but also to have a fast enough transient response to capture the detail in drums and cymbals. It can be used for close‑up vocals but needs an external pop filter in this application, unless the singer has exceptional breath control. A sensitivity of 25mV/Pa (1kHz into 1kΩ) is specified, with the equivalent noise just 6dB A‑weighted, which is impressively low. There are no pads or filters, and the maximum SPL is 136dB. Using my Universal Audio Solo 100 mic preamp, I compared the Wedge to several other cardioid‑pattern condenser microphones, all with similar-sized diaphragms, but at a variety of price points. Most of the others were noticeably brighter sounding on vocals, presumably because they had more exaggerated presence peaks. The Wedge seemed to emphasise frequencies around the 250Hz area, which resulted in a nice, warm sound, but one that tended towards sounding congested on some sound sources. Using equalisation to dial in a gentle 250Hz dip, plus a 6‑7kHz hump of only two or three dB, produced a very nice vocal sound, with both body and definition, so there's no problem getting this mic to respond well to EQ. It was pretty much the same story with acoustic guitar: I needed to take out some lower-mid frequencies and boost the 'zing' a little, but not excessively. This produced a well‑balanced guitar sound, with plenty of detail but no aggressive harshness. I was also impressed by the lack of noise, even when applying high‑end EQ boost. As a percussion mic, the Wedge picks up the low end very solidy, and without EQ it seems to smooth out the highs without making them sound dull. In some ways, the sound reminds me of a ribbon mic, but there's a little more high‑frequency extension — which means that it could be particularly useful for flattering bowed strings and some wind instruments. Violet seem to be marketing this mic as a bit of a Jack‑of‑all‑trades, and in many respects it fits this billing very well, because the neutral sound lends itself to everything from vocals to drum recording. In some respects, this makes choosing the Wedge more difficult, though, because most microphones are bought to do a fairly specific job. However, the fact that this mic is so quiet and can be equalised very effectively should make it particularly useful in studios, where you never know what job will come through the door next. 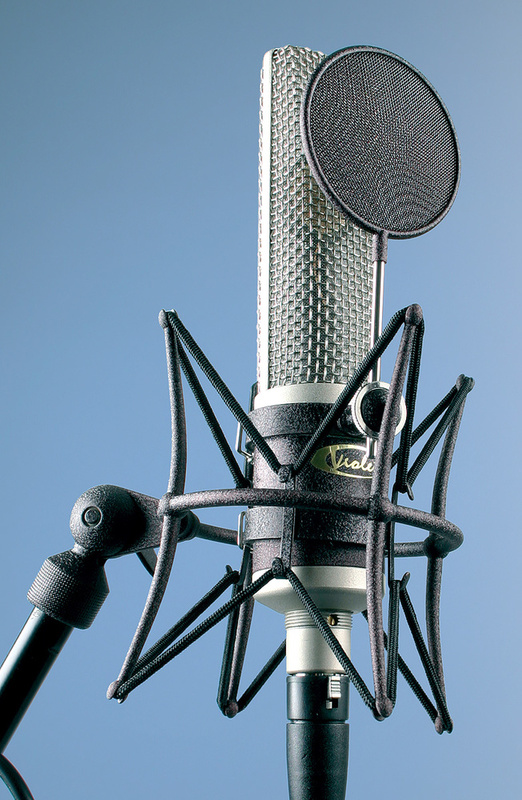 For the project‑studio owner who records mainly their own music, a mic's vocal performance is perhaps most likely to be the deal‑maker or deal‑breaker. Leaving aside the EQ possibilities for a moment, the Wedge would suit a singer who needs to add weight to their voice, while at the same time smoothing over some high‑end roughness. It doesn't roll off the high end in the same way as a ribbon mic does, because the frequency response extends up to 20kHz and beyond, but somehow it still manages to sound smoother than most typical capacitor microphones. On balance, then, the Wedge is sensibly priced, nicely styled and can be EQ'd to suit a wide range of sound sources. Some large-diaphragm Rode models exhibit a smooth, yet extended top end that isn't entirely dissimilar to that of the Wedge. I couldn't find a mic in my own collection that had exactly the same kind of sound character, although the inexpensive Studio Projects B1 came closest in terms of 'warmth'. Before EQ, it might be perceived as a bit 'chesty‑sounding' on some voices. The almost flat frequency response of this mic doesn't quite tie up with its subjective tonal qualities, which seem to gently emphasise the lower-mid range and smooth over the highs, but it has a warm, refined character that responds well to EQ. Violet Design +372 64 55 007. Violet Design USA +1 608 227 2040.